A couple week’s ago our family had a super special experience. 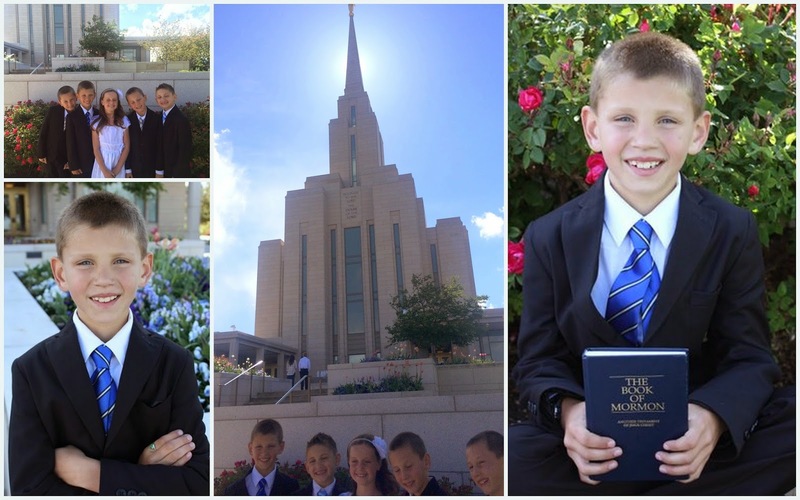 Our son, along with my sisters son (who just happens to be best friends) chose to be baptized members of The Church of Jesus Christ of Latter Day Saints. It was a beautiful day and such a neat experience to see these two sweet boys choose to follow the example of their Savior. It’s amazing how close to God these children can be at such a young age of 8. I was so impressed with their faith and dedication to follow God’s plan. I sure just love these boys and wanted to share some of the highlights of that special day. Besides the baptism being an amazing experience, we spent the remainder of the day with friends and family. We had a barbecue in our backyard and enjoyed visiting and being together. Our boys love Milky Way candy bars and so their desserts of choice was anything with Milky Way’s. We decided to make Milky Way Chocolate Chop Cookies (sounds complicated but it’s just a chocolate chip cookie recipe with chopped up candy bars in it–yum!). 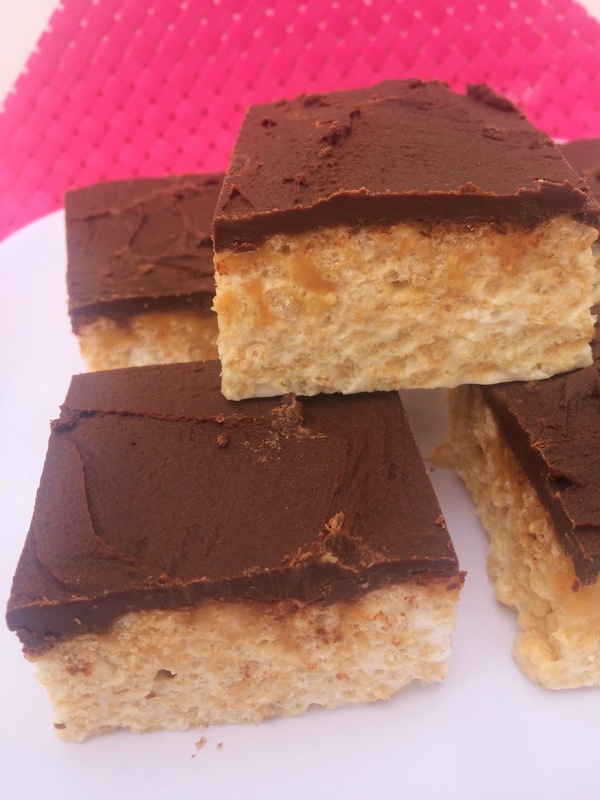 We then found a recipe for Milky Way Rice Krispie Treats on Pintrest. I decided to come up with my own version and these were definitely the hit of the party. If you’re looking for a quick dessert to make for Memorial Day, this one’s a crowd pleaser for sure! Spray a 9x13 pan with cooking spray. In a large pot, melt the butter until mostly melted and then pour in the mini marshmallows. Turn oven to medium-low heat and let the marshmallows heat until smooth. Stir marshmallows and butter together until the marshmallows are pretty much all melted. Add in the vanilla extract, stir and stir in the crispy rice cereal. You don't want to add to much cereal or it will be too dry. Just enough cereal so that it is nicely coated with lots of marshmallow and buttery goodness. Pour the mixture into the 9x13 pan and gently press the top of the rice krispy treats until evenly spread into the pan. Let them cool while you prepare the caramel. In a microwave safe bowl, unwrap the entire bag of caramels and place into the bowl. Pour the tablespoons of whipping cream and stir until coated with cream. Place the bowl into the microwave and cook for 30 seconds. Remove from the microwave and stir. If the caramel is not melted, place back in the microwave and continue to cook for an additional 30 seconds. Do this until the caramel is smooth and stirs easily. Pour the melted caramel on top of the rice krispy treats and spread evenly. For the chocolate layer, place the bag of chocolate chips into the same microwave safe bowl that you cooked the caramel in. Pour over the chocolate chips the whipping cream and stir again until coated. Place into the microwave and cook for 30 seconds. Stir and then repeat the process in 30 second increments until the chocolate is melted. Pour (or drizzle) the chocolate over the tops of the rice krispy cereal bars and spread until smooth. Let the bars rest until ready to serve. Congratulations to the 2 young men and their families! It sounds like everyone had a wonderful weekend. Again, congratulations! Take care & have a wonderful rest of the weekend & Memorial Day! What a blessing for your families and the boys – congratulations!! No better way to spend a weekend 🙂 I can't wait to try this recipe…it looks so delicious.